Obviously, actually icing a cake is a skill that requires development and practice. Clearly I have yet to participate in such practice! I'm just thankful that lil sis had left her glasses upstairs when I put the cake on the table - no scathing comments for me! 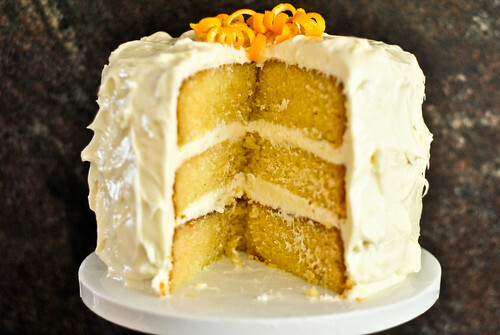 This recipe comes from http://theredspoonblog.com/2011/08/megs-favorite-orange-cake/ - definitely worth a look! 1. Preheat the oven to 180 degrees and line 3 9-inch cake tins with baking parchment. In a large bowl, sift together flour, sugar, bicarb, baking powder and salt before adding the oil, orange juice, eggs and sour cream. Beat at a medium speed with an electric mixer until smooth. Pour into the cake tins and bake for 20-25 minutes or until a wooden prick inserted into the centre comes out clean. Let the cakes cool in the pans for 10 minutes before removing and letting them cool completely on wire racks. 2. In another large bowl, beat the butter and cream cheese for the icing at medium speed until creamy. Add the orange juice, beating until combined and then gradually add the icing sugar, beating until smooth. 3. For assembly, check out www.theredspoonblog.com/2011/08/megs-favorite-orange-cake since I am evidently completely incapable of doing a good job! With a bit of skill, that I do not possess, this is how beautiful the cake can look!